But like words, numbers can be interpreted to serve a person’s agenda. When confronted with the news that New York families are staying in homeless shelters 30% longer than they used to, the city mayor took a rather large leap of illogic. Living in a shelter is “much more pleasurable” these days he’s quoted as saying in the article linked below. Unfortunately, Mayor Bloomberg isn’t the only powerful, rich person who is out of touch with reality when it comes to homelessness. That misconception is shared by way too many. Read the article below to hear more about Bloomberg’s example of politicians putting a spin on facts to further an agenda outside of reality. “The Mayor’s assertion that homeless New Yorkers are staying in shelters longer because they are ‘much more pleasurable’ is shocking and offensive,” said Mary Brosnahan, executive director of the Coalition for the Homelessness, in an emailed statement to the Wall Street Journal. via Mike Bloomberg And His 11 Homes Think New York Homeless Shelters Are Too Damn Nice. Homeless Disagree – New York – News – Runnin’ Scared. I can imagine Chris from Painted Black as a young boy, sitting in front of his house drawing on the sidewalk with chalk while waiting for his mother to come home exhausted from her second shift. Maybe chalk really is a gateway art supply. One of the main characters in Painted Black is a graffiti artist and perhaps because of this I admit to having a tolerance and, in some cases, even a fondness for graffiti. When is art art and when is it vandalism? Can it be both? I know only a little about the graffiti culture, but I do know there is a difference between tagging (marking your symbol/initials) and burning (a large, elaborate painting, usually applied legally.) Just as there is a difference between free speech and vandalizing property. If I see either painted on fences and walls in my neighborhood it doesn’t bother me at all and may even, if well done, be admired. Kim over at Wistfulskimmie’s Book Reviews gave Painted Black a 5 star review today. I’m so excited because she had such nice things to say. It is so gratifying to have reviewers applaud the very elements I tried so hard to do right. Thank, you, Kim. I will certainly let you know when the second Street Stories novel is ready to read. This is the story of Jo Sullivan. 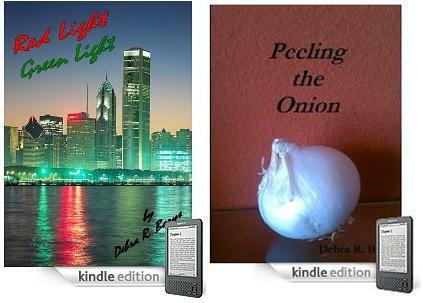 She is a reporter, writing short stories about the forgotten homeless of Chicago. This is a mystery and Jo must get to the bottom of a missing teenage prostitute, a dodgy funeral service that specializes in freeze drying corpses for those that can afford it, and a possible link between the two. With a Youth Worker and one of the prostitutes closest friends for help, she tries to get to the bottom of the mystery whilst fighting her own demons at the same time. I enjoyed this immensely, but it was also quite gritty at the same time and made me think of the fates of others, especially the ‘forgotten’ homeless. Whilst on the one hand highlighting the fate these teenagers have to face, it was also a good mystery at its heart. Jo and Chris are damaged in their own ways and must put aside their mistrust of each other to work together. It is a gripping story. A real page turner but also very sad. The characters were true to life and leapt out of the page at me, at times their pain was tangible. The ending was sad but right for the book. A great mystery that highlights the problems facing the homeless more or less every day. I shall certainly look out for more by this author. via Wistfulskimmie’s Book Reviews: Painted Black by Debra Borys. Ever wonder if the settings you picture when you’re reading a book matches what the author had in mind when it was written? If the writer has done well, the picture you’re given should be clear to you, or at least never give you details that contradict what you’ve been led to believe. 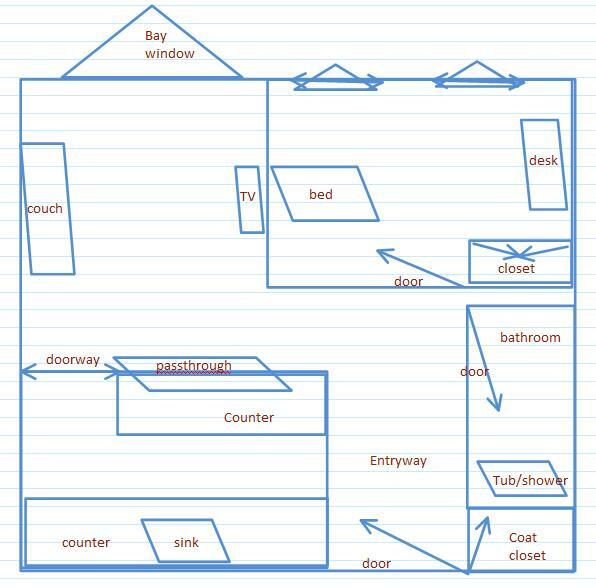 Here’s a very rough drawing of the layout of Jo’s apartment. I have no space planning experience and this is not drawn to scale. Just a sketch to give you an idea of what I had in mind as I wrote. Is it anywhere close to what you pictured? Does it at least not shatter your perception of what it should be? If you’ve read Painted Black, I encourage you to go to Amazon, Barnes and Noble, or Goodreads and leave a review. I’d love to hear everyone’s feedback, both good and bad. That’s how authors make the next book even better. Painted Black is the fast-paced story of the nearly invisible people living on the street, and the people who prey on them. Set in Chicago, Painted Black gives a gritty look at the hidden reality of homelessness, and the lengths these pariahs are forced to go to, just to survive. The story follows street-beat reporter Jo Sullivan in her obsessive search for a missing teenage girl. As she uncovers clues to the girl’s whereabouts, Jo comes face-to-face with gutter-level hardcores, social working soft-hearts, and a truly Kafkaesque villain. A good story with a wicked twist, Painted Black is definitely one to read. via Amazon.com: James W Ewing’s review of Painted Black.